At the end of the 2010 football season, people questioned if the Georgia Bulldogs would ever be relevant again under Mark Richt. Fast forward to the 2012 season and the Bulldogs have a legitimate shot at winning the BCS National Championship. Ranked No. 6 in the nation, Georgia will try to win just their second season opener over the past four seasons. That will not be a problem. The question will be whether the Bulldogs will be able to come out with the needed excitement and intensity to be properly prepared for the week two match up versus Missouri. 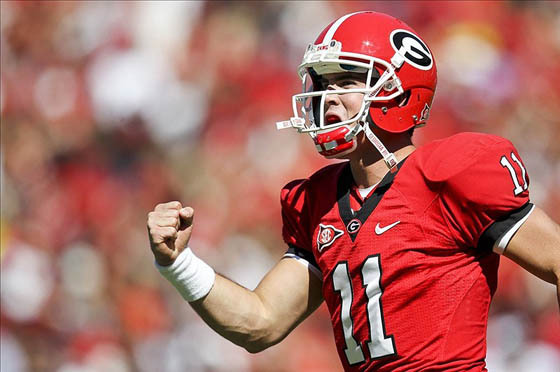 The Bulldogs will be led on offense by junior quarterback Aaron Murray. Murray is on pace to shatter the SEC passing records and only needs 14 touchdown passes to become Georgia’s career leader in touchdown passes. However, the question remains; Can he win a championship? Aaron Murray will have plenty of weapons at his disposal as the Bulldogs return five of their six leading receivers minus only tight end Orson Charles. It should be noted that Malcolm Mitchell will see less snaps early on but Marlon Brown may have turned the corner. Brown was a Parade All-American, Tennessee’s “Mr. Football” and scout.com’s No. 2 wide-receiver prospect in the nation coming out of high school. However, three seasons later only has 382 receiving yards and four touchdowns. At 6-foot-5 and 222 pounds he could put this Bulldog offense over the top. How good this Georgia offense will be is unknown at this time, however, they should have plenty of help.The Bulldogs should field a defense this season that rivals the 2011 version fielded by LSU and Alabama. With stud linebacker Jarvis Jones and their 350 pound nose tackle Big John Jenkins leading the way, this defense will be tough to move the ball against. Buffalo is unlikely to find any success against the first and second defensive units for Georgia, Buffalo’s only hope of scoring against them will rest on the shoulders of junior Branden Oliver, who ran for a school-record 1,395 yards and scored 13 TDs last season. Buffalo did upset a Top 25 opponent, beating then-No. 12 Ball State 42-24 in the MAC championship Dec. 5, 2008. However, Georgia is not Ball State. Look for Georgia’s defense to blitz early and often until the top two units are removed. Aaron Murray will have a field day, but all eyes will be on the Georgia backfield. Georgia is likely to give four running backs carries in this game with Ken Malcome, Richard Samuel, Todd Gurley and Keith Marshall. Can either of these four backs separate themselves from the other before the Missouri game? Gurley has been the most impressive back in the fall but Malcome is the more experienced pass blocker, which always plays a part in Coach Richt’s tailback selection. Ken Malcome looked impressive in the Bulldogs’ bowl game last season as he rushed for 51 yards on 12 carries against a strong Michigan State defense. The other top story line of the day will be who takes the field. Baccari Rambo, an All-American in 2011, and linebacker Alec Ogletree are also reportedly suspended, but Richt will not say so publicly and both were on the final depth chart. Both are likely to miss the game but it is at least worth watching for. Prediction: This game will not be close but will still be interesting to watch. How will Malcolm Mitchell look? Is Gurley ready to be the starting tailback? Is Marlon Brown finally going to become the player he was recruited to be? Time will tell but this game will be a blowout. Stat of Game: Aaron Murray 4 total touchdowns.